Invisible Heroes of World War II is a collection of unique stories of WW2 heroes that we don’t hear so much about, or, as the subtitle more accurately conveys: “Extraordinary Wartime Stories of Ordinary People”. The first half of the book focuses on the stories of individuals, the second on groups of people who performed heroic feats together over the course of the war. The main focus is on people from the US on the battlefield, behind enemy lines, and at home. I really enjoyed how Jerry Borrowman gave life to stories that are not so “popular” in WW2 historical fiction and movies nowadays. The story of Pat Patton, survivor of the Bataan death march, who hid in the Philippines for over a year, continuing to fight the Japanese until he was captured, and then survived capture, is incredible. The fact that the Navajo code talkers had to keep their wartime activities a secret until 1968, never mentioning how they basically helped turn the war around, is insane. The stories of the engineers, whose work was a huge part of the Allied victory were fascinating. I spent ages researching images of the Bailey Bridge and trying to visualize how amazing a feat it would have been to install one under enemy fire in the space of a few days. Incredible. All of the stories are interesting: those missing in action, whose bodies have never been found, the woman photographer and journalist who found herself on the frontlines, the Nisei battalions whose courage saved stranded soldiers, despite the fact that their home country has incarcerated many other first and second generation Japanese-Americans. I could go on, as there are more in the book. I personally think that there were some stories that were missing from the collection (I think all readers can probably think of their own missing stories), but as the book is mainly US-focused, maybe they wouldn’t have a real place in the book anyway. What comes to mind are the Polish Army in Monte Cassino, Italy, a huge deal especially when you know that many of the soldiers had spent time in Stalin’s gulags before being set free post German invasion of the USSR. Another story is that of the village of Oradour-sur-Glane, decimated by the Nazis in 1944, or maybe Jean Prévost, resistant in the Vercors. Obviously I would love to see these types of stories also appear more in mainstream media as they are part of my own personal heritage and legacy. In any case, Invisible Heroes of World War II is a good read if you are interested in WW2 stories, stories of heroism, learning more about unsung heroes of war. I consider myself a bit of a know-it-all about Europe during WW2, but I learnt a lot from this book! This book is part history, part mystery, and part love story, and it is riveting! I love reading about WW2, spies, and real love stories during the war, and this book hit the spot for me in terms of it being a great balance between deeply researched fact and personal interest. I really like to read about areas of WW2 that people rarely talk about. My step grandfather was part of the Free Polish Army that fought against the Germans at Monte Cassino (after having spent time incarcerated in Siberia and being released when Germany invaded the Soviet Union), so I found it interesting to read about how the Allies made their way up the boot well before the D-Day landings in France, as we don’t see it documented as much. Because the Italians spent a lot of time as part of the Axis we tend to dismiss them as being the “enemy” during WW2 when it is in no shape or form that simple. I love how Monopoli Blues sheds a lot of light on Italy and the Italians during the later years of the war. Tim Clark’s father and mother met each other while they were both working for SOE (Special Operations Executive) in Italy during WW2. Marjorie was a radio operator, and Bob (Lt Bob Clark) spent his time going back and forth between Allied-held and German-held areas on different missions (retrieving POWs, sabotage missions, reconnaissance, etc). Both were based in Monopoli (hence the title of the story), and married on their return from the war. Tim Clark was always interested in his father’s time during the war, but Bob remained tight-lipped about it during his life, only giving away few insights here and there. 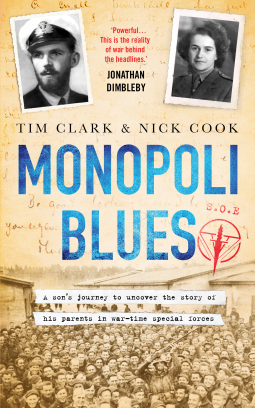 After he died Tim took it upon himself to discover the entire story, which ended up becoming 5 years of research, trips to Italy with and without his mother, and this book, Monopoli Blues, that he co-authored with journalist Nick Cook. Monopoli Blues is heavy on the detail, and Tim Clark leaves no stone unturned. I appreciated this immensely because it provided so much insight into SOE and what type of work they were doing in Italy at the time. It also helps us understand how Bob ends up landing behind enemy lines, and being captured. Bob ends up spending 6 months in a Nazi held prison, and then a prison camp, before being liberated and reunited with Marjorie. In any case, the amount of research and work and most likely tears that it must have taken to write this book is incredible. A great read for those who like to read about WW2, who also like a good mystery, and who don’t mind getting deep into the details of SOE work near and behind enemy lines. (As a side note I recently refused to continue a book on a similar topic, where the author ham-handedly wrote a phrase stating that “most of the French collaborated with the Germans”. Having grown up in Maquis land, I know all too well how false and offensive that statement is. It was a breath of fresh air to read Monopoli Blues where the author shines a light on the difficulties of surviving in a country occupied by a brutal invader). Thanks to Netgalley and the publisher for the copy of this book! 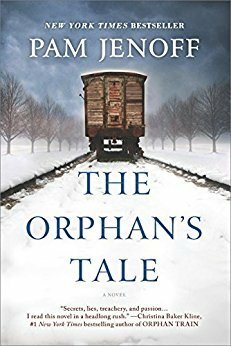 Last week I finished a book based on a circus in WW2 and lamented the fact that the author had completely omitted to add any content on the persecution of Roma by the Nazis, and how there really isn’t much fiction about the systematic murder of nearly a quarter of the European Roma population during WW2. So I was really glad to see that Mario Escobar had written Auschwitz Lullaby, a novel heavily based on the true story of Helene Hannemann. There are many, many books, fiction and non-fiction, on the horrors committed on the Jewish population in Europe during the Holocaust, rightfully so, they should never ever be forgotten. But there are other people who were also persecuted due to their race, and I do think it’s important that they are not forgotten either. The Roma, who have been systematically persecuted and discriminated against for centuries, are one of these groups. I applaud Mario Escobar for telling their story. Auschwitz Lullaby is the story of Helene Hannemann, her husband Johan who is Roma, and their 5 children between 1943 and 1944. In 1943 the SS come for her family, and while she is told she is free to go, due to the fact that she is not ethnically Roma, she obviously doesn’t want to leave her family. They end up in the “Gypsy” camp in Auschwitz, where Helene and her children are separated from Johan. After a request from Josef Mengele, Helene, due to her German “Aryan” heritage and training as a nurse, is put in charge of the children’s nursery in the camp, where for a while the imprisoned Roma children, as well as some Jewish children, are able to eat a little better and enjoy clean water and even movies. The nursery ends up being a front for Mengele to keep all of the children (mainly twins) he is using for his horrific experiments, but it keeps Helene and her kids relatively safe for a while, and in return she is able to keep other children safer than they would have been in the barracks alone. This IS fiction, but it’s so heavily based on truth that it reads like a memoir in journal format. Helene’s voice is strong and powerful, her love for her children is warmth in such a terrible place, and her heart and will to continue despite everything so inspiring. Exceptionally beautifully written in parts, the tone is however often devoid of hope – Helene knew how it would all end, and focused on making each day bearable for her children, rather than dreaming of the future. There are terrible, true descriptions of acts of horror (which one should expect if one is reading a novel based on genocide and extermination camps), and if you are looking for a happy ending, this isn’t the book for you. If you are however looking for a truthful story based on the reality of what happened during WW2, then please read this book. My only complaint (and it's a bit of a big one) would be the use of the word “Gypsy” all through-out the book. Granted, this was the word used to describe the Romani at the time, and often still is today, although the general consensus is that it is an ethnic slur and should be phased out. Maybe there should be an added note in the author’s note about this? It just jarred me every time I read Helene referring to another woman as a “Gypsy woman”, as well as all of the generic “Gypsy” terms. I highly recommend this book, and some of the additional reading below. Thanks to the publisher and Netgalley for the advance copy! WW2 literature is my go-to area when it comes to looking for something new to read... I don’t know why but for as long as I can remember I have been obsessed with the time, and try to read anything new that comes out based in the 1930’s and 40’s, fiction and non-fiction. 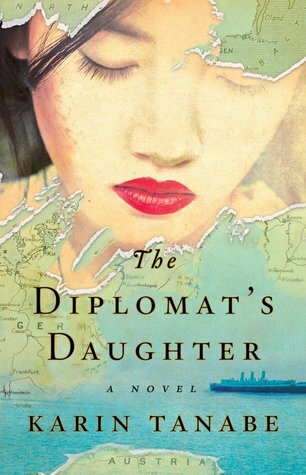 The Diplomat’s Daughter’s plot stuck out for me, especially as the plot revolves around areas less talked about today: what happened to Japanese and German nationals and Japanese and German Americans residing in the US when the war broke out. The Diplomat’s Daughter is the story of Emiko (Emi) Kato, Leo Hartmann, and Christian Lange. Emi is the daughter of a Japanese diplomat, and while she was born in Japan spent most of her childhood and teens in Europe (Germany, England, Austria), and speaks fluent Japanese, German and English. Emi meets Leo, an Austrian Jew in Vienna in the latter half of the 1930’s, where they become friends and then fall in love. When Emi’s father is transferred to the US they fear they will never see each other again. When Japan declares war on the US, the Katos are removed from their homes and put into detention camps in preparation for their transfer back to Japan, but Emi contracts TB and has to stay behind until she is well again. She meets Christian, an American born in Germany to German parents, in an internment camp in Texas. With these three characters Karin Tanabe is able to create a narrative of war, growing up, of love, of learning that home may not always be home, and of how a country can turn against its citizens in a flash because of fear. The novel takes place in Vienna, the US (several locations), Shanghai, and Japan, and we is a well-researched romance that revolves around the internment of Japanese and German people (including Japanese and German Americans) by the US government during WW2, conditions in Japan during WW2, and the insanity and horrors of Shanghai at the time. I have read about Shanghai in the 30’s and 40’s before in my all-time favorite novel Gone To Soldiers, and the author does a great job conjuring up the living hell that it was for many. I had a little trouble getting into the novel at first, as the timeline and characters shift back and forth a lot, especially in the first half. But once the characters started to come to life for me I had to find out if they all made it through OK. There is so much more to the stories than the short summary I provided above, and so much history, places, people... BUT, before being a story about the war it is a romance novel. The war is a backdrop to the love stories, and sometimes you may find your eyes rolling a bit. There are some scenes that are a little contrived, but for the most part the story moves along quite well. It wasn’t entirely what I expected, but it was well written and I am happy I read it. There is one scene that I found quite triggering in the novel, and I wasn’t expecting it at all – it was completely unnecessary in my opinion and weirdly much more graphical than the love scenes which on the contrary were glossed over. Would love to hear other peoples’ thoughts on this!